If you’re a regular exerciser, then listen up! Being even the tiniest bit dehydrated before you begin working out can have a significant effect on both your performance and motivation to get moving. Inadequate water levels leads to fatigue and mental exhaustion, as well as issues with your internal temperature control, meaning your workout feels more difficult than it should, both mentally and physically. Also, dehydrated muscles can actually shrivel up and result in fatigue earlier on, further affecting your performance. 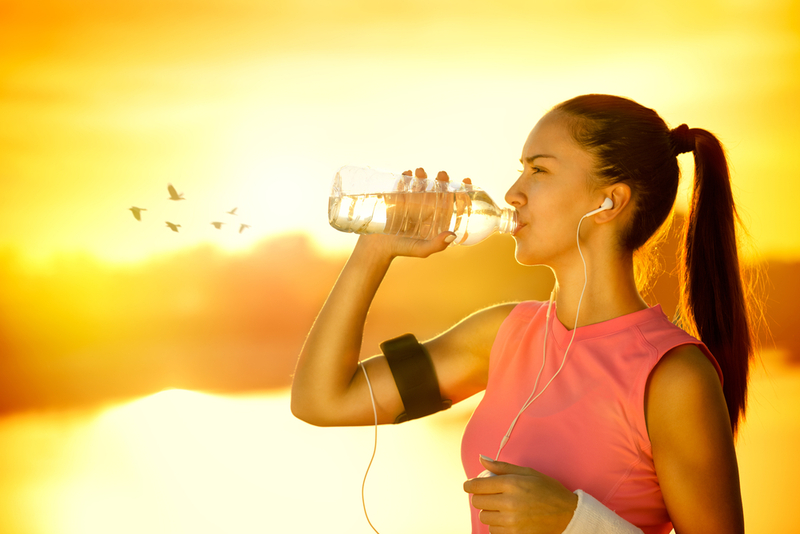 You should not only be drinking water at regular intervals throughout your workout, but during the hours before to ensure your body is in tip top shape. Sluggish digestive system? Water could be just the answer you’ve been searching for. Water ensures that everything is moving smoothly throughout your entire digestive tract, helping to eliminate toxins, prevent constipation and improve metabolism. This has a flow on effect throughout the body, which can actually result in improved weight loss results! If you feel yourself getting headachey and tired throughout the day, then dehydration may be to blame. Having even slightly low water levels throughout your body can directly impact your mood, memory and brain function! Ensure that you have water by your side throughout the day, especially if you’re undertaking tasks that require brain power, like work or study. Dry, dull complexion? Don’t worry about expensive skin creams—you should simply try upping your water intake! Our skin is our body’s largest organ, which is directly aimpacted by our internal fluid levels. An increase in water will plump out your skin and lips, decreasing the appearance of wrinkles and combatting dryness. A natural (and free!) beauty solution for all ages. How are you going to try increasing your water intake each day? Are there any tips or hints you have up your sleeve?